Many thanks to Pearly for sending me this. Just wonderful! One of my favorites from my teenage years. Not just the tune but the very words too. .."till by faith I met him face to face..."
Just perfect except for the choice of some pictures used. This version sung by Carroll Roberson. 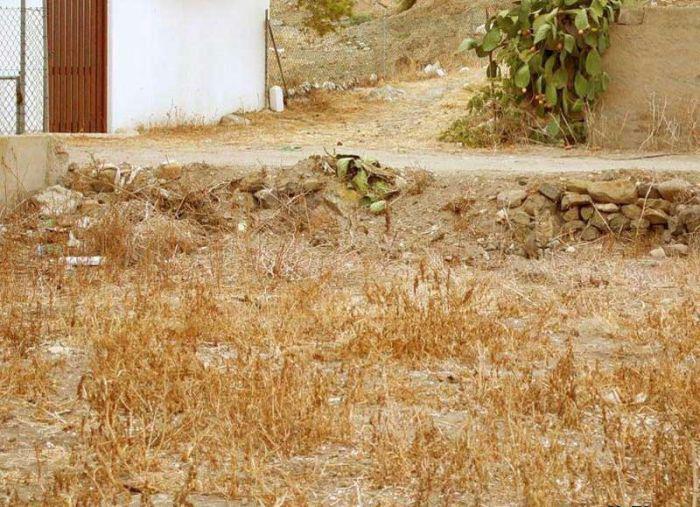 Can you spot the cat? A friend posted this on her facebook inviting us to try. I am putting it up here not to tease others to find the cat but to drive home one important point for my kids - It is important to revisit your work because as humans, we see what we want to see. That is, there are features that are important which we will inevitably miss. I shall be waiting for them to tell me if they have found the cat. It is not that difficult if you have found it, and infuriatingly hard if you haven't. Again this is familiar isn't it? Nothing is truly hard or easy. What matters is if you are determined to understand it and keep at it until you have got it. These stories always read better in publications than in real life isn't it? I know this issue well as I have a special needs child too. I worked extremely hard with her and she has succeeded spectacularly. 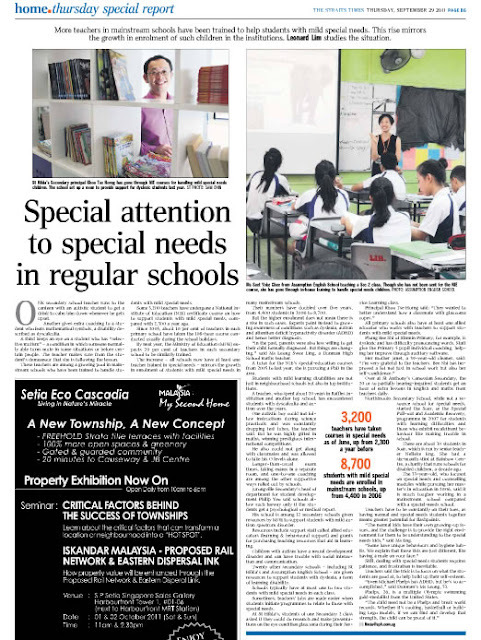 One primary school teacher was special and very dedicated to helping her. At that time her condition wasn't even identified. Those were extremely stressful years for me. My hair turned gray quickly. Except for some unusually sensitive souls, most people think she is quite normal now. She is fortunate to be blessed with high cognitive ability and the determination to overcome her condition. She now has more friends and relate to people better. It was not easy at all to get to this point, and there a ways to go yet. My plan to help her developmentally is only good half the time, the other half I had to make it up as I go along. From my experience, I think schools can be very helpful but the family is the most important contributor helping a special needs child succeed. If you are a follower of the Way, you will find the Master ever present. He is always present at the times I have to make up what to do as we go along. As a result the doctor said we are more than able to cope, there is no need to see her regularly. The power of the Gospel to heal. Specifically, I suspect to rewire the brain or grow new connections, create neurological bypass, whatever. From here you get a glimpse of the new bodies the Lord will give us to replace this one. A first hands on by Engaget on the Kindle Fire. Very speedy browser. The tablet does't look sleek like an iPad. In fact, it appears a little thick. Its selling point is the price, at $199 it is $300 cheaper than the entry level iPad. I expect it to be very popular. If I get one, it would mostly for reading kindle books in the dark, which I do regularly and accessing emails. I am not interested in the music and videos. Games are out too. I no longer make the time for such things. I am quite interested in the Kindle Touch, which is the old kindle without a keypad and now support touch screen technology. I often look up words, underline and make notes. The keypad has been a test of patience to use each time. There could also be one surprising benefit. Perhaps the experimental web browser would now be practical to use, again because of touch technology. And the Kindle Touch. Noticed that the screen refresh is so instantaneous, it is hard to tell a page flip. Finally a more usable keypad on the display. Promised wifey to put up the official Kindle Fire video for her to view. Serendipitously stumbled across this pic from Iremember.sg. This is a good shot because it wasn't taken recently. The sorry pic I have shows the place prepared for demolition. I remember coming here almost every Sunday after church. We usually ate one of the following: Mee Siam, Lotong, Duck noodle and a local dessert next to the Mee Siam stall. Many of us share part of our roots here. 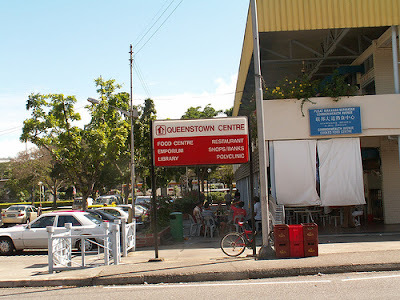 It is not difficult to come across someone who had used to live in Queenstown. Dr. Tan Cheng Bock let on today that he used to live in a 3-room flat along Margaret Drive. Here a pic of the hawker centre from the Sunday Times, I thought I had inserted in an earlier entry but apparently not.